In so many areas of the world and particularly Whatcom County we are seeing large areas of forest, farm and vacant rural tracts of land being overly developed for residential housing. Our planet is a living organism that needs water, soil, trees, foliage and clean air in order to live in a healthy state. The earth was gifted to mankind to create a habitat for the evolvement of all species of human and animal life and their ability to co-habitate together. This deeper spiritual understanding of purpose far exceeds current political, religious, economic and environmental actions. 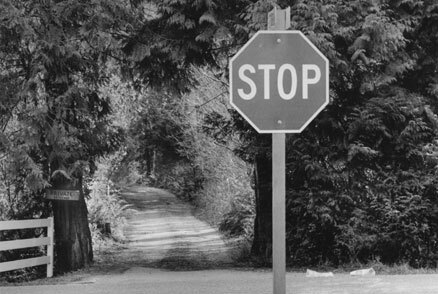 This traffic sign seems appropriately placed on the roadway near the entrance to a beautiful driveway leading to an alluring secluded residential hideaway. The sign symbolically reinforces the notion that we are at a place in our evolvement where Point Roberts residents should stop and think about the future growth patterns for the whole community. There is still an opportunity to maintain the elegance of natures balance with our needed growth. A metaphysical message is understanding that The Point could become an international example for other communities to consider.